About a couple months ago a free-range feline showed to a Wingham backyard seeking help for his cold/sniffles. A quick trip to the friendly Wingham Vet and some pills and he was back to mooching tummy rubs from anyone that approached him. 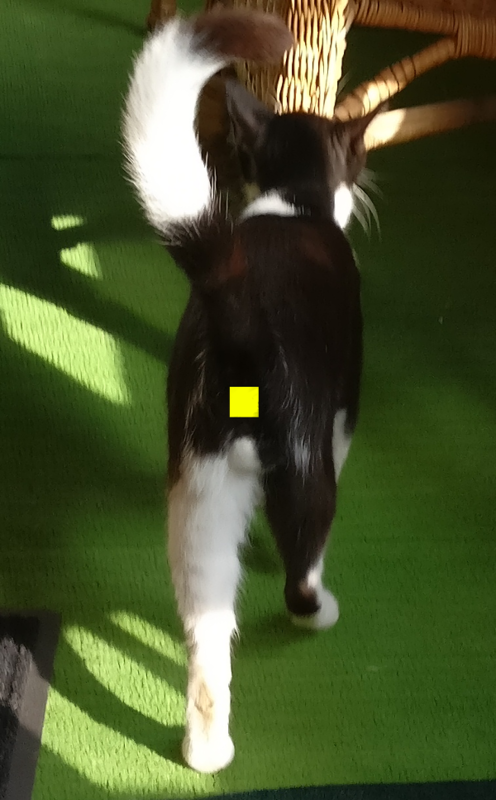 As you can see by the picture Deez Nuts has very distinctive markings on his manbits. His babymakers are divided right down the middle like Sia’s wig or a half-and-half cookie inspiring numerous monikers. NOTE: In the photo Deez Nuts' exhaust port is obscured to protect his remaining dignity. His markings are so comical that every human that has seen them in person has laughed. His current moniker of Deez Nuts was inspired by his introduction of “You gotta check out deez nuts”. Deez Nuts would obviously prefer to remain unaltered as he really doesn’t want to hang out with a family if one of their conditions is that you have to cut your nuts off to stay. He is willing to wear a collar and bell, but would prefer to be naked. If this is your cat or you are interested in letting Deez Nuts hang out with you and your family click on the following link for more information.